Fri., Aug. 31, 2018, 3:25 p.m.
SEATTLE – Branden Jackson put his hard hat on and went to work. No, literally. The Seahawks’ second-year defensive end went to Lowe’s this week to buy home supplies, and left with a neon yellow construction vest and a white hard hat instead. He bought the set because he knew it would match his lime green sneakers. But that wasn’t the only reason. The 6-foot-4, 295-pound Jackson did just that on Thursday, to the tune of three tackles and one tackle for loss in the Seahawks’ 30-19 defeat to the Oakland Raiders. Quinton Jefferson, who Jackson continues to battle at the strong side defensive end position, added two tackles in defeat. “I took my game up a notch because I have to,” Jackson said. “With Quinton in here, me and Q are pushing each other – two guys from Pittsburgh who know each other, longtime friends. But when it comes to football we’re playing the same position. We’re battling for the same spot, and we’ve got guys like Dion (Jordan) who will be back and he’s going to be in the mix. That’s because Saturday is cut-down day for the Seahawks and the rest of the NFL, meaning that each organization must trim its roster from 90 to 53 players by 1 p.m. Jackson – who made 11 tackles in 12 games with the Seahawks last season – is likely safe, especially considering Jordan’s ongoing injury situation. Still, the third-year pro – who went undrafted in 2016 and began his career with the aforementioned Oakland Raiders – understands what it feels like to teeter on the fringe of a roster spot. “It’s a feeling you really can’t explain, man,” Jackson said. “It’s a deep gut feeling – uncertainty. It’s terrible. From a guy like me who has made a cut and has also been cut, this time around I’m a lot more level-headed and a lot more confident in my play, especially because of what I’ve done. So I’m just going into this with a clear mind, knowing I gave them everything I could. I think it’ll play out the way that I want it to. Austin Calitro is another expert. 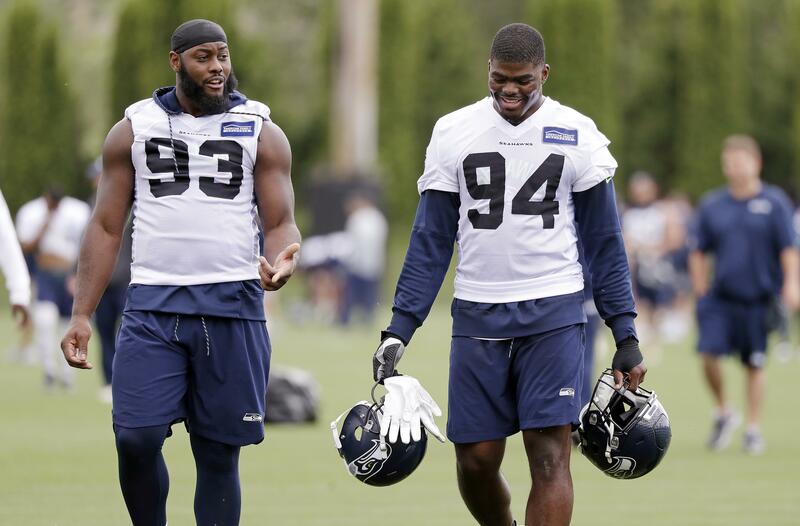 The second-year linebacker – who finished second on the Seahawks with five tackles and a sack on Thursday – bounced around four different NFL rosters last season. It appears he may stick in Seattle, however, as Calitro has solidified himself as a competent middle linebacker backup to all-pro veteran Bobby Wagner. “Bobby and K.J. (Wright) took me under their wing right away, and I was very thankful,” Calitro said. “Bobby has been a great mentor, and I’ve tried to emulate my game after him a little bit. Hopefully it’s showing. The 6-0, 240-pound Calitro has made the most of that opportunity, but there’s no guarantee it’ll result in a roster spot. The goal, in essence, is to earn an opportunity to put a hard hat on and go back to work next week. “I feel like I did what I was supposed to do here,” Jackson said. “I don’t really concern myself with decisions I can’t control. I feel like, at the end of the day, Seattle gave me an opportunity when no one else did. I came on and made some plays and they welcomed me. And throughout this camp they welcomed me. I’ve had endless opportunities. Damore’ea Stringfellow can’t really explain what it feels like to score. “At that moment I can’t say there was too much going through my head,” said Stringfellow, the second-year Seahawk wide receiver who ran past Raiders cornerback Raysean Pringle on a go route for an 81-yard touchdown. Granted, there probably have not been enough wins for the 6-2, 209-pound Stringfellow to land on the Seahawks’ 53-man roster. But Thursday’s highlight may have cleared the way for a spot on the practice squad. And that’s no small feat, considering that there are currently 13 Seahawk wide receivers essentially vying for five or six spots on the active roster. The team would likely only carry two more receivers on the 10-man practice squad. Will one be Stringfellow? He’ll find out sooner than later. There’s that hard hat again. Published: Aug. 31, 2018, 3:25 p.m.